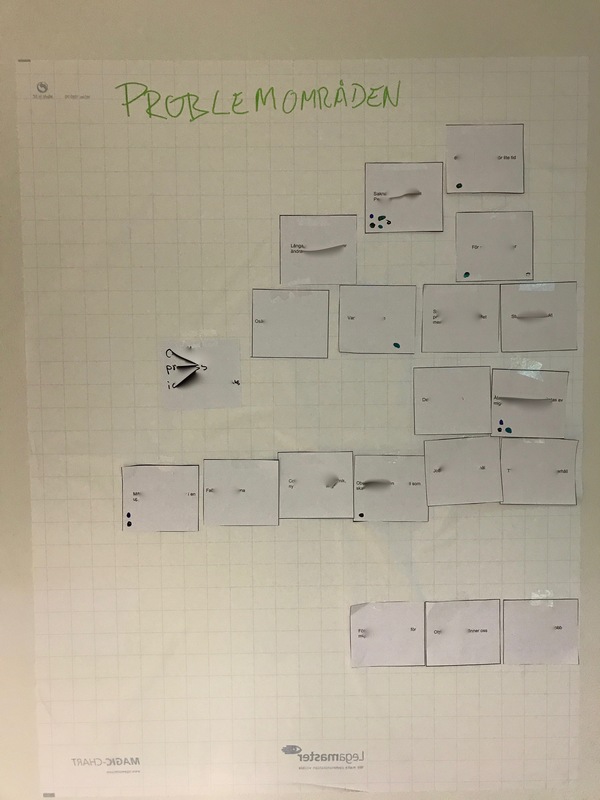 After some introductions we listed all their identified problems and facilitated a discussion where they could prioritize them based on level of pain for the organisation. It was not a total straight line for prioritization, a few of them was left as fairly equal in priority. We ended this session with dot-voting what kind of problems that they primarily wanted to address with the change. When starting a change and transformation you want to create an awareness WHY we need to change, what is the goal with the transformation? In this case they have discussed their challenges in previous work so we gathered them before the workshop and let them discuss and clarify them once again for themselves. If you have not gathered the problems you want to attack, you can use questions like the ones below to trigger discussions and identify key areas to address. Use the workshop pattern divide – merge. let them discuss in smaller groups and merge for alignments. What is causing us pain in regards to delivering value? If we would ask our customers, what is the feedback they would tell us? What could happen if we don’t change? With a good problem statement and clear vision statement for the future you have a solid ground for creating awareness in the organisation when communicating around the change to the rest of the organisation. In this workshop we asked them to individually draw their vision on a piece of paper and then present it to the others. Making sure they were aligned in their vision about how the organization and culture should be in the future for both the employees and their customers. Next part in the workshop was to start creating some desire for potential experiments and also have some fun together. We run a team shapes fun exercise where they could experience difference between component teams and feature teams using post-it and pens. Lot of laughs and energy in the room, and many good take aways. We thought it could be helpful to have an existing scaling framework to lean against since that could simplify how to motivate some potential experiments and also make the change more tangible. By introducing LeSS we could discuss LeSS principles as for instance importance of empirical process control (even if that is also a Scrum principle), Large Scale Scum is Scrum and customer centric. We wanted to highlight these principles and guide a few experiments to learn if we were on the right track with the idea that had been growing about running multiple team scrum, one common product backlog, feature teams. And doing it in a way with many experiments where they would decide both what to try out and also if the experiments was leading to improvements, or should be done differently. The reason we wanted to introduce LeSS and see if they would be willing to use LeSS as guiding framework, was that their existing way of working seemed like it would be helped by a few obvious experiments if LeSS principles was looked at. Also their own principles for a potential new setup that they had identified and agreed upon, also indicated a close match to what would be beneficial for LeSS. And of course it was interesting to remove some structures, like for example many different team product backlogs and the set up with projects that created dependencies for some of their deliveries. We talked about principles in LeSS and also introduced the roles, events and ceremonies. After the LeSS introduction we had some more discussions reflecting over their guiding principles for their new organization. 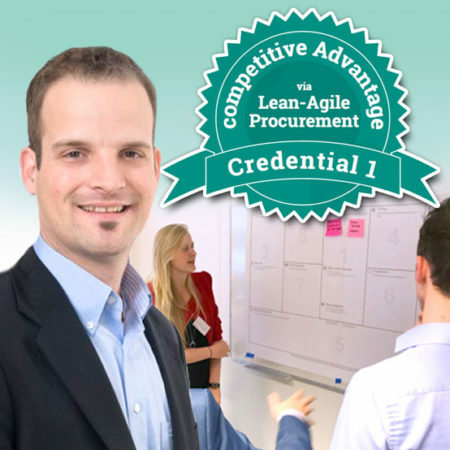 The group wanted to add one principle; “shorter time to deliver customer value”. Other principles they had identified earlier was for instance “few or no hand overs between teams” and ” possibilities to grow and learn new things”. Sitting in smaller groups they got a printed visualization of 3 teams with deliveries on a 6 months time axis and some lego to use for prototyping. What kind of potential teams could they try out and test? How would the existing teams competences and structures change over time? When do we do a first team experiment? What are the deliveries the teams could and should do? Are there different team strategies or missions? You can see the empty template below. Working in smaller groups prototyping teams gave us several prototypes. They got inspired by each other, threw bad ideas away and iterated a couple of times on the different ideas on how they could create better teams based on the organizational principles and deliveries. Lego can be used for so many things in these kind of workshops, they got really engaged, tested and discussed different ideas and views. 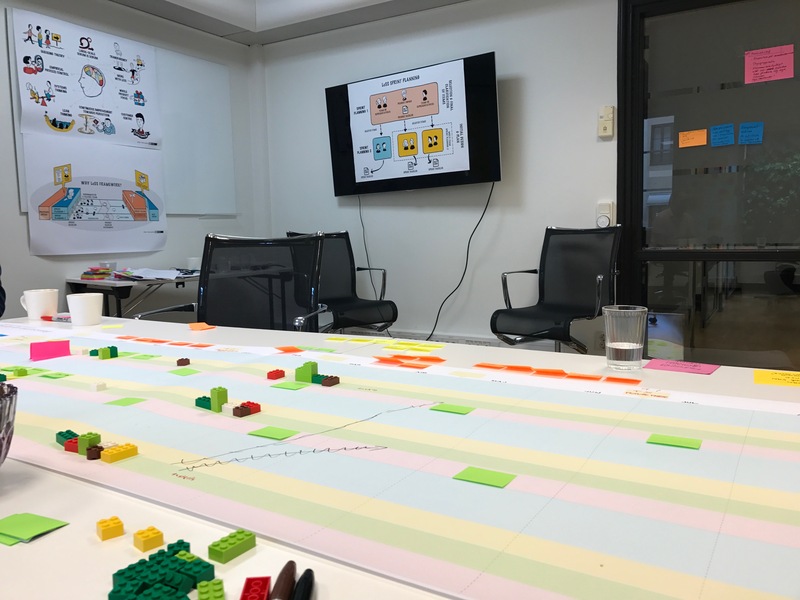 Using Lego representing the capabilities (competences) in the teams and how that shifted over time based on the teams missions and roadmap made it really tangible and they could prototype various ideas to see if they could find even better ideas. After discussions they agreed on a few things to experiment with later during the autumn. At the end of day two we agreed on some decisions and put them on a timeline for what experiments we should do to improve the organization. 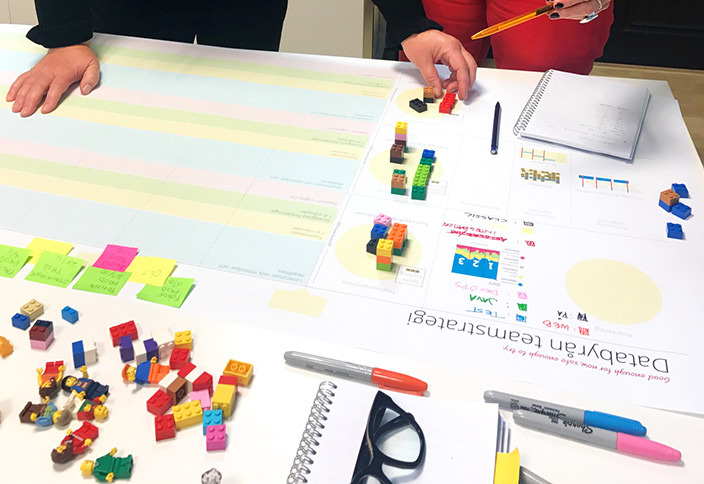 By experiencing the benefits of feature teams in a fun simulation and prototyping different scenarios they could identify what kind of teams they would like to experiment with in a first phase. We agreed to do a team self selection for two new feature teams and also to use LeSS as guiding framework and using one common backlog that all teams work with. I will describe that step in their journey in a up-coming blog post. Overall we had good alignments on where they want to go and awareness for why change is needed and a true desire to test and experiment. Now it was time for the change management group to bring this to the rest of the organisation and start preparing for the autumn experiments!